There are many national and local festivals in Hua Hin and Cha-Am, but there are only few that stand out and they’re all worth your time to come and see why tourists from the world over find them thoroughly enjoyable and utterly fascinating. –The International Kite Festival. The festival runs from March through May and is held once every two years. During the festival, all kinds, colors, shapes and sizes of kites are displayed. Participants come from everywhere and foreign tourists, as long as they can fly a kite, can also participate. 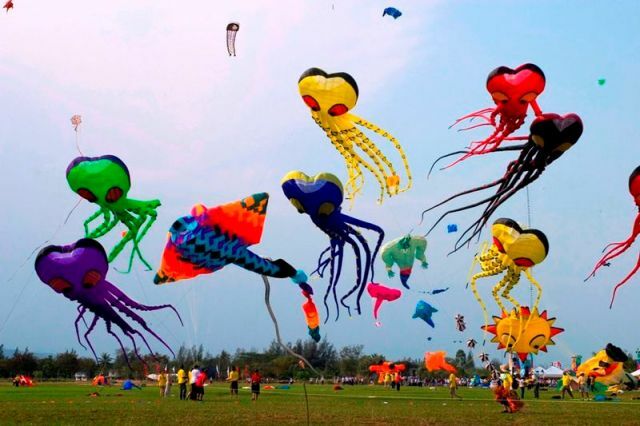 Some highlights of the festival include: display and demonstration of Thai and international kites, display and demonstration of stunt kites and high-tech kites, kite-fighting battles, art kite contest and sale of local products. This is truly a festival that celebrates the artistry to be found in this seemingly light sport of kite-flying. – Hua Hin Jazz Festival. Every year in June and July, Hua Hin and Cha-Am receive hundreds of visitors worldwide who want to see the Hua Hin Jazz Festival. Jazz professional musicians, artists and bands, local and international both, gather in the beach for a night of jazz music, and tourists and music-lovers head to the area to enjoy melodious music by the sea. Some of the highlights of the festival are on-site jazz music workshop, games and draw contests. – Hua Hin Vintage Car Rally. This festival is for the lovers and collectors of vintage cars. Every year in December, a procession of classic cars going around town with its drivers and passengers decked in 1920s attire happens in Hua Hin. The festivities run for several days but the highlight is the parade itself. After the parade, partying, music and lots of delicious food are the order of the day. – Hua Hin Golf Festival. The Hua Hin Golf Festival draws loads of tourists each year. From August to September, Hua Hin and Cha-Am host the festival that attracts golfers from around the world to come not just to experience the culture and festivals in Hua Hin/Cha-Am, but also to enjoy low green fees everyday for two months! Most of the major golf courses in Hua Hin/Cha-Am offers huge discounts during this time, and tournaments are held which is the highlight of the festival. For a fee, anyone, including foreign visitors, can join the tournaments. Venues rotate between golf ranges in Hua Hin and practice ranges in Cha-Am, and great prices await the winners. The festival is one of the few times that Hua Hin and Cha-Am get really crowded and busy with golfers and all kinds of tourists.